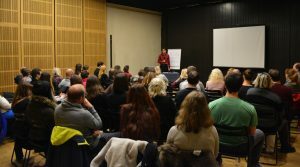 Lecture entitled “Philosophy helps us get through the crisis: Lessons and examples from the Stoics”, organized by New Acropolis Maribor at the ‘Vetrinjski Dvor’ public lecture hall on World Philosophy Day. The activity was attended by a large audience in addition to being recorded by Agora radio for the Slovenian minority in Austria. Each visitor received a small gift, a bookmark with a phrase of the Stoics.